A lot of firms aren't waiting anymore, 250 firms to go to Holland, not sure if that includes Fords and Nissan, all the banks have ensured that they can still do business in the EU, still the pollution should go down somewhat. But you can not prove it and would not like to see another referendum to prove your point, and virtually ever opinion poll on this is lie. But you cannot prove it either. OK. 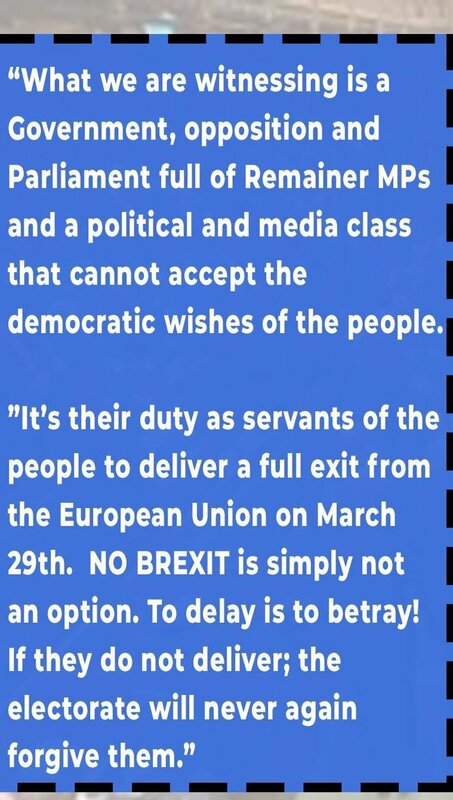 Lets us have another referendum but not complete it if the Remainers win. Will there be a whining and a wailing from them? Of course there will and they will be screaming how unfair it is, but that is what they want to happen to the first referendum. Is that fair or not? Alternatively, if the UK gives up the nonsense of an increasingly unwanted Brexit, there would be no problem whatsoever. British people. A majority in the largest turnout in a U.K Democratic vote. Apparently this is considered as a not so important item by the U.K. government/parliament. The U.K government has repeatedly stated that they will not erect a hard boarder, similarly the P.M of the I.R and the president of the E.u. Have also categorically stated they will not impose a hard boarder. So who is going to? Nothing to do with Brexit? Electoral fraud is not democratic. Good old EU, make up the rules as you go along, Priceless. Give us some actual examples of what risk there is to the EU if the border stays open after Brexit. Somebody said previously that sub-standard beef could be exported to the UK, then re-labled, then transported to RoI and then into EU countries. The cost of doing all that would wipe out the profit, and also the whole process would eat into the beef's sell by date. So this is not going to happen. If the EU were to install a border the troubles would start again. It would re-start a war. People will die. Which option do you think the peace loving EU will take - leave the border open and risk a few fast boiling kettles making their way into Dublin, or install a border and start a war? There will be no border! Vote Leave may have overspent by something like £500k, but the Remain campaign effectively got an extra £9m of taxpayers money through that leaflet drop. That should have been illegal. "Should have" is your opinion, that is of little importance to me or to the law. I thought the whole damn thing was control our borders! What are these Epsilons on about? Exactly the reason why it would not be possible to have a Brexit without a customs union with NI, if we end up with a No Deal Brexit we will be pushing Ireland back to ﻿the last century and it's problems.